SILICON SLOPES, Utah, April 15, 2019 /PRNewswire/ -- MX, the leading provider of financial data services, today announced MoneyMap with Pulse – a completely self-guided financial wellness tool that banks and credit unions can use to empower their customers to become financially strong. With guided financial advice, customers increase engagement with their FI, make better decisions in real time through AI-driven personalized insights, and build financial strength. "Traditional methods of budgeting simply don't work for large portions of society – too much of the burden is placed on the individual," said Ryan Caldwell, Founder and CEO of MX. 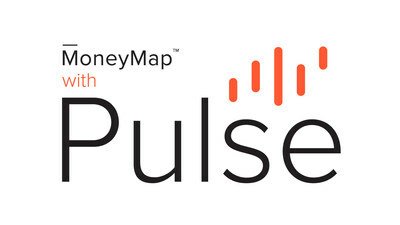 "The solution is MoneyMap with Pulse. We're ushering in a new age of financial wellness where our technology does all the heavy lifting – from proactive notifications to guided, personalized financial advice. With the use of technology, financial institutions can help their customers build better financial habits without having to fundamentally change their budgeting behavior." Caldwell states that "new technology is redefining how people interact with their finances, which in turn leads to observable increases in user login, engagement, and NPS." "Following the MX and Personetics partnership announced in February, we are pleased to incorporate AI-powered insights and advice capabilities into MoneyMap with Pulse, giving banks and credit unions a streamlined SaaS implementation that significantly shortens the time to market," said Brett Allred, Chief Product Officer at MX. "In addition to the consumer benefits, it's easy for financial institutions to get started and stay ahead of big tech competitors. Existing MX clients can be integrated in as little as 30 days." "Banks and credit unions are at risk if they are not investing in the data capabilities and assets that are going to drive AI technologies in the future," said Ron Shevlin, Director of Research at Cornerstone Advisors. MX helps financial institutions and fintechs utilize their data more effectively so they can outperform the competition in a rapidly evolving industry. As the leading provider of financial data services, MX enables its clients and partners to easily collect, enhance, analyze, present and act on their financial data. Using MX's platform and products, MX clients are able to understand their customers in real time like never before, allowing them to be truly customer-centric. Founded in 2010, MX is one of the fastest-growing fintech providers, partnering with more than 1,800 financial institutions and 43 of the top 50 digital banking providers. For more information, visit www.mx.com.